More sour grapes… Take away Obama’s teleprompter and this man is a babbling idiot. He taught Constitutional Law, but did he ever actually read the Constitution? The Electoral College far from being a ‘vestige’ took up more words in the Constitution than any other subject, clearly showing the importance and the weight that the founders placed upon it. He clearly also doesn’t understand that Senators were specifically not apportioned according to population, but 2 per state, that the Representatives in the House were apportioned according to population. 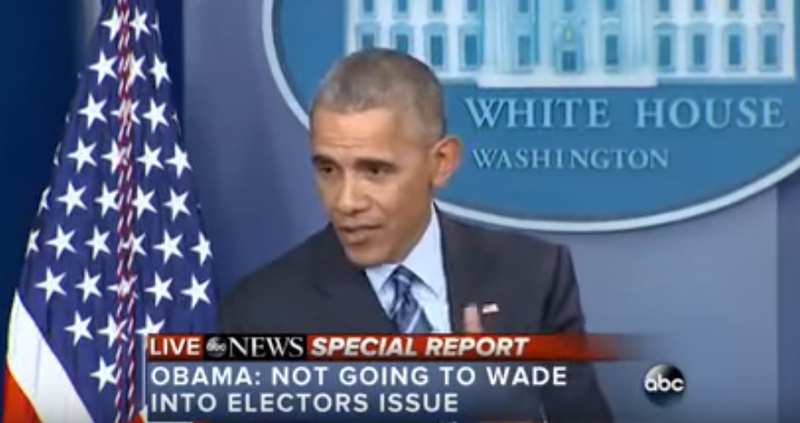 “The Electoral College is a vestige, it’s a carryover from an earlier vision of how our federal government was going to work that put a lot of premium on states,” President Obama said during an end-of-the-year press conference. Obama, who once taught constitutional law at the University of Chicago, had been asked by a reporter about thoughts on the Electoral College given that Donald Trump carried it while losing the popular vote to Hillary Clinton.